A tangible quality that can be purchased. 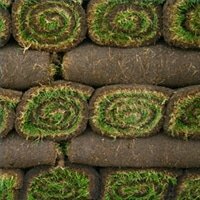 Sod installation provides a mature turf which has less probability of failing than a new seeding. Quality sod will be weed-free, whereas any new seeding will have some weed invasion. Sod is normally usable within two to three weeks. When consumers make a decision to buy sod, they can see the product they are buying, but when purchasing seed, there is great difficulty in estimating the turf quality of the end product. Sodding may have advantages, but it has problems, too. The initial expense of sodding is prohibitive for some. The limited sod mixture selection may be a handicap in certain environments such as shade or where one desires exotic varieties. The successful rooting of sod is dependent upon many factors. It has been observed that Kentucky bluegrass has difficulty rooting in the early summer after seed-head inflorescences have emerged. Summer sod installation of cool-season grasses such as bluegrass can be successful if irrigation and sod-bed preparation are adequate. 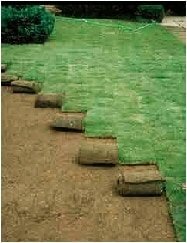 Sodding is frequently considered to be an expensive means of establishing turfgrass; however, if one is careful to consider the total cost of a seeding, especially in situations where seeding is being used in marginal areas, the cost of sodding can often be cheaper in the long run.